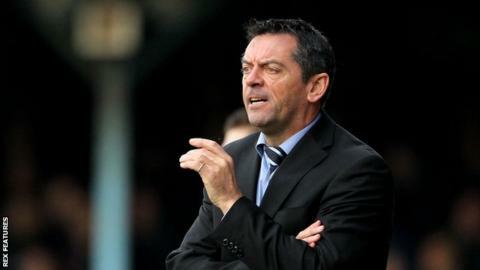 Southend United manager Phil Brown has praised Walsall ahead of his team's game against the Saddlers on Saturday. Walsall beat Gillingham on Tuesday to enhance their automatic promotion hopes, while Southend's play-off chances are all but over, with the club nine points from sixth place. Brown told BBC Essex: "On Tuesday myself and (assistant manager) Graham (Coughlan) went across to Gillingham. "We watched one of the best performances I've seen all year." Walsall are currently five points from second-placed Burton with a game in hand, while the Shrimpers have only won one game in their last five. "I think they've got one of the players of the division in Romaine Sawyers," Brown added. "He caused all sorts of problems in behind the front man (against Gillingham). "Their physio (Jon Whitney) is now managing the football club, and I don't know the lad but he seems as if he's tactically aware. "The flaw in their character, possibly, is that if their home form matched their away form they'd win the title. They're not as good at home as they are away."